I haven't had much time to blog lately, but I'm determined not to miss another Chocolate Friday. Yesterday I went in search of Mrs. Beeton's Book of Household Management and found a wonderful resource for old and out of print books online: Project Gutenberg. Some of them are complete html with illustrations and everything. Unfortunately, Mrs. Beeton's was only available in plain text, and something called Plucker, and the text only was sadly sans pics, but I downloaded it anyway. I love this kind of stuff. I love peeking in on days gone by and seeing how they lived and what they valued. The other great find was this: Chocolate and Cocoa Recipes and Home Made Candy Recipes, by Miss Parloa and Mrs. Janet McKenzie Hill. This is an amazing collection of chocolate recipes from different women, collected and presented with a few pictures and lots of references and definitions and explanations. I can't seem to find the original publish date, but both women were born in the mid 1800's so I guess somewhere in the 1880's. I've only browsed through 20 or so of the recipes, but I feel as if I stumbled on a gold mine. A chocolate gold mine. I know, it's public domain type material, and this isn't the only source, but this is MY first discovery of it so let me enjoy the special moment. I can see there might be a small problem finding modern day replacements for some of the ingredients. Since the book was written/compiled for Walter Baker & Co., most of the recipes call for specific Baker products. Since Walter Baker & Co was absorbed into the Kraft General Foods Corp. in 1927, some of its products are still being made. But I suppose there are sources now for just about any choco/cocoa products that could be used as substitutions. Anyway, this is where I'm going to start. Fudge was my mom's favorite thing, and I'm hoping to serve these for our Mother's Day gathering, in honor of my favorite woman. Mix all ingredients together but vanilla; cook, stirring constantly, until it begins to boil, then cook slowly, stirring occasionally, eight or ten minutes, or until it makes a firm ball when dropped in cold water. 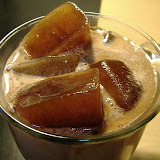 When cooked enough, add the vanilla and beat until it seems like very cold molasses in winter. Pour into a buttered pan; when firm, cut in squares. Great care must be taken not to beat too much, because it cannot be poured into the pan, and will not have a gloss on top. 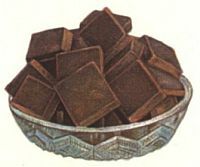 I have been making cocoa fudge for years, in fact it is the only kind I like.